You can use ExpanDrive to connect to your object storage cloud powered by OpenStack and Swift. Using ExpanDrive you connect to Swift object storage by specifying a server, username, and API Access Key. ExpanDrive gives you the opportunity to connect to your OpenStack Swift Storage using a familiar file browser interface native to your OS. 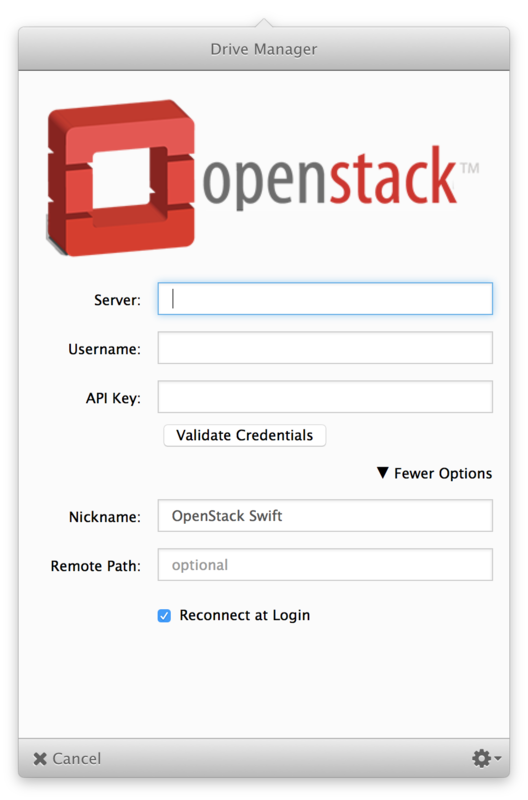 Click on OpenStack Swift Storage. The OpenStack configuration screen is displayed. Server Host name of your Open Stack cloud server. api key API Access Key required to connect to swift storage. Note: Get your API access key from authentication service you chose when installing. You have some options for auth, including tempauth (which is included with Swift), swauth (an auth service for Swift as WSGI middleware that uses Swift itself as a backing store that is provided via download from Github), the OpenStack Identity Service (project named Keystone), or you can use your own authentication system. For more information see the OpenStack documentation.